Make no mistake about a program called BadNews Ransomware as it is extremely dangerous. The first major indication that this intrusive program is up and running on your PC is a warning message telling you that you no longer have access to your data. If you unfortunately have already seen this message, make sure not to waste any time and remove it immediately. Initially, ransomware applications are designed so malware developers could profit from Internet users in an illegal manner. This is usually achieved by locking huge amounts of data and asking for a ransom. It is important to note that in some cases your files could be simply corrupted once and for all by this harmful piece of software. To have a better understanding of how BadNews Ransomware works and how you can remove it, make sure to read the rest of our report. 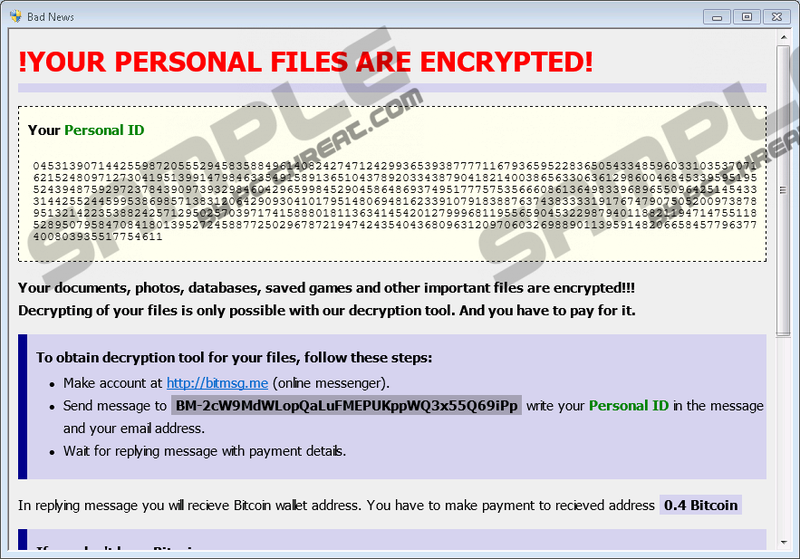 It has been found out that BadNews Ransomware is basically a different version of other infamous programs of this classification such as HappyLocker Ransomware, MafiaWare Ransomware, Hollycrypt Ransomware and quite a few others. As it turns out all of the mentioned malicious applications including the one in question are created on an open source project entitled HiddenTear, which at first was used for educational purposes; unfortunately, malware developers found it useful as well. Therefore, nowadays you can encounter a variety of devious programs based of the HiddenTear project. So to no surprise, the malicious program in question functions in an almost identical way to its counterparts. Upon intrusion, it simply identifies files on your hard drive and starts the encryption procedure. Mainly, this malware affects your text and image files; each file locked by it receives a .badnews extension. Right after the encryption process is over the indication of what has happened will be presented to you in the form of a warning message. It hosts a person ID that is required for a decryption procedure. Unfortunately, it can only be useful if you purchase the decryption tool from creators of this malware. It costs 0.4 Bitcoin, which is around $360. Even though it might seem like a way to save your precious data, you must be informed that paying for decryption services does not guarantee that you will actually regain full access to any of your files. It is likely a scam as there is no legal agreement that binds cyber crooks to actually do anything even if they receive your money. It should be more than obvious that a complete removal of BadNews Ransomware is a must if you are a security-conscious user. Our research team highly advises you to take precautionary steps to enhance your overall virtual security if you wish to avoid BadNews Ransomware or any other devious program. Since in quite a few cases this malicious program is spread via spam e-mail campaigns, you should only obtain attachments that come your way from known senders. Also, make sure to avoid all sorts of suspicious third-party download sites as they a notorious for hosting bundled installers. Such dubious setup files are a preferred distribution method by malware developers. Therefore, by avoiding all unauthorized download web pages and obtaining all of your software from their official vendors' websites only, you will significantly reduce the chances of infecting your PC in such a way. While all of this will help you maintain a clean operating system, the most important thing regarding your computer's security is a professional antimalware tool. Such a tool is paramount because it can identify and warn you about any virtual threat beforehand and so it keeps your personal computer safe and secure at all times. The complete removal of BadNews Ransomware should be executed as soon as possible. Even if you are not able to catch this devious application in action, make sure to use the instructions that we present below as soon as you are presented with the warning message. Once you are done with the manual removal, we firmly recommend double-checking your entire operating system for potential leftovers associated with BadNews Ransomware. It is important to perform such analysis since traces of this malware could trigger its silent restoration. If you find all such termination procedure and analysis of your computer a bit too complicated, we advise you to use a professional antimalware tool to delete BadNews Ransomware in an automated manner. Right-click the malicious .exe file and select Delete. Keep in mind that the name of this file is randomized. Quick & tested solution for BadNews Ransomware removal.